There hasn't been a new, great Christmas song for years. Novelty records and the John Lewis Christmas advert song simply don't count. The glorious eighties, decade of The Pogues: Fairytale in New York, Wham: Last Christmas, the granddaddy of Charity Christmas tunes 'Do They Know It's Christmas?' and, erm, Cliff's Mistletoe and Wine is thirty years ago now. All we've had since is a yearly outing from Michael Buble covering Sinatra's back catalogue while dressed as Santa. And that Mr Blobby song that an entire nation has since denied purchasing despite it spending three weeks at Number 1 in 1993. You can't really imagine today's songwriters (except perhaps Sir Gary of Barlow) writing a Christmas song that will enable early retirement from the royalties alone, spending the rest of their days living out the 'About A Boy' dream (see: Mel 'Christmas Song' Torme and Irving 'White Christmas' Berlin). As I heard my eighteenth rendition of Slade in two hours of battling the hordes on Oxford Street last weekend I rued the lack of new Christmas songs. It was getting to the stage where I was needing a good glug of Christmas 'spirit' otherwise I planned to track down the plug and yank it out of the wall in the manner of over-enthusiastically pulling a Christmas cracker after too much Egg Nog. A new song might just give humankind a little break for one year from Wizzard et al shouting about how much they wish it could be Christmas EVERY DAY. To this end and sustained by a giant loaf of Stollen, I've spent the entire evening listening to "Now...That's What I Call Christmas" (on repeat) to figure out exactly what does make a good Christmas song. X Factor contestants of the future take note. Six and half hours later I can conclude that a hit Christmas song involves a catchy tune, sentimentality combined with a slight bittersweet edge and lots and lots of jangling sleigh bells. 2. Spread the mincemeat over the pastry sheet, leaving a 2cm border. 3. Starting from the longer edge of the pastry sheet, roll into a swiss roll/ sausage shape. Brush with beaten egg. Cut into 2-3cm thick rounds and form a circular wreath on a baking sheet, overlapping each round. Chill for 20 minutes. 4. Remove from the fridge and brush any exposed edges with the remainder of the egg wash. Scatter with the almonds, cranberries and zest. Bake for 20-25 minutes until golden brown and puffed. Carefully remove to a wire rack to cool a little. 5. 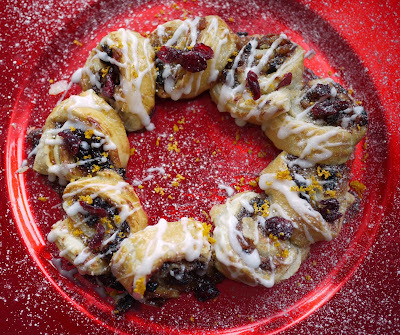 Mix the icing sugar with a little water to make a smooth icing, then drizzle over the wreath. Serve warm or once cooled. What are your favourite Christmas songs to bake along to? I do love a good Christmas song! feeling very festive today and wearing my Christmas jumper at work...bring on the celebrations and food like this lovely mince pie wreath! I am just about ready for Christmas songs now.........have been wearing ear defenders while shopping until this week !! Your wreath looks fabulous, thanks for the recipe and idea. I must admit that I am rather partial to Kelly Clarkson's Christmas song this year - and that's a sentence I never thought I'd type. One of my all time faves (being a child of the 80s) is Christmas Wrapping by the Waitresses. What a wonderful wreath and nice take on mince pies! From the photo it looks like you added the cranberries and orange zest after the ring was baked, as they are on top of the icing, yet in the recipe you say to add them and then bake-which is correct? Thank you for your comment. I added some extra cranberries and zest on top of the icing for decorative purposes for the photographs - this is, of course, optional and I should have made it clearer in the recipe. Happy baking!